I have no idea what possessed the one who did this to do what he actually did! The poor dog who is supposed to be taken cared of by humans, stewards of God's creation, is actually being treated with utmost cruelty! I am so furious... hay! punung-puno na ba ng iba pang aso sa loob kaya sa spare tire nalang sinabit si Bantay? baka naman nadidiri lang siya marumihan ng sakong may lamang aso ang kanyang leather seat? PAWS Philippines is already tracking who should be held liable for the act (story here) but I'm pretty sure that a few thousand pesos will set this person off the hook. Pretty much like what happened to those responsible for the pitiful fighting dogs of Cavite. The poor furry guy is said to have been freed already (full story HERE). I hope someone picks him up, treat him well, and provide him a family and home that will help remove all that BDK 617 trauma away. En route to Baguio? Oh no. 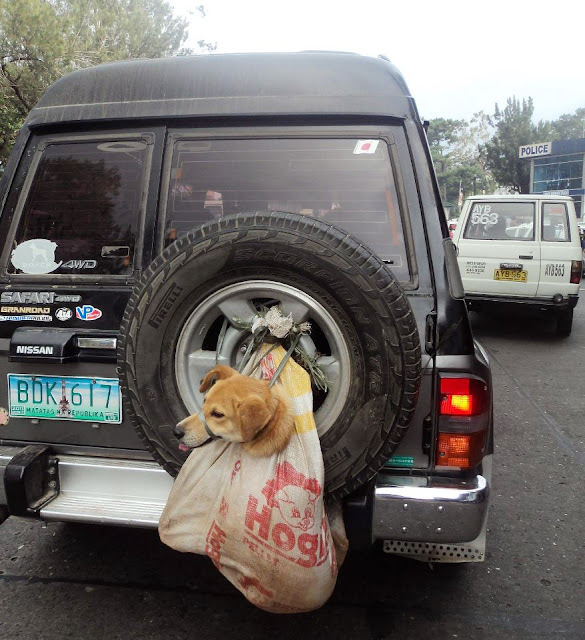 If that car came from NCR, sobrang kawawa lalo yung aso. i hope that SUV wasn't tagging the dog along way back from Manila! No, no! i agree. and what's sadder is that i believe we don't have some prohibitive law against this type of cruelty. yung batas na nangangagat talaga. a few thousand pesos nga lang ang bail for this if charged at all. most cases like this never get charged pa, so, sad talaga because people aren't THAT scared from harming animals. OMG! :O that's just too cruel... :'( i hope whoever did that gets the punishment he/she deserves. That's sick! I hope that person gets what he desrves...if not by human law then by God. OMG I'm so shocked!!! I really hope they get who ever is responsible for this ugh!!! OMG. I can't believe some people can do this. We should have a law against this and especially against the "asusena." I have a pet dog and I love him so much and I just don't understand how people can be so cruel to these loveable creatures. based on the photos, the police got the guy, asked him to let the dog loose, and that's it. i can't say that dear mutt has really been freed kasi baka he was placed inside instead, i really don't know. i'm sorry to write about something so heartbreaking, hay. i can't help it, i feel so strongly for them. They actually got to him. Sayang lang since he wasn't really sanctioned for it. Well except maybe for the hate that his Safari's plate number is getting from all this.